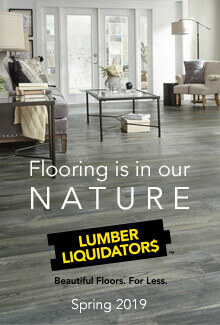 When it's time to install a new floor let Lumber Liquidators refresh every room in your home. As America�s largest specialty retailer of hardwood flooring, they understand the right floor can turn the average house into an extraordinary home. With over 400 varieties of flooring to choose from, you�ll find classic and contemporary styles in an assortment of stains, textures, and finishes. And all the accessories to get the job done right! Shop their digital catalog or website for hardwood, vinyl, laminate, bamboo, and porcelain tile floors. Premium Hardwood - Bring the warmth, character, and natural beauty of hardwood to your home with a hardwood floor from Lumber Liquidators. Crafted to last, their expansive assortment offers a variety of options: domestic or exotic hardwood, solid or engineered. They offer an array of finishes, widths, and a broad color palette of stains that are sure to complement any space and impress you (and your guests) for years to come. Bamboo Flooring - Bamboo floors offer great performance and the look of exotic hardwood for less. Bamboo is a fast growing grass that produces new stalks without the need for replanting. For added durability there�s strand bamboo. It�s 2x harder than Red Oak. Available in both traditional tongue-and-groove and click varieties for easy installation. Cork Flooring - Naturally beautiful, sustainable, and comfortable cork flooring is crafted from this renewable resource to create a distinct style in your home that not only offers a unique look but also provides a supportive, cushioned surface underfoot. Lumber Liquidators offers a variety of cork styles in both easy click plank and squared tiles. Laminate Flooring - Available in a variety of designs to match any style or budget, laminate flooring combines the look of real hardwood with easy click installation and stain, wear, and scratch resistance. Lumber Liquidators also offers water-resistant laminates: Dream Home Ultra X2O and AquaSeal. These floors offer the look and feel of hardwood with the added benefit of water-resistant technology, making them a great choice for rooms like kitchens and mudrooms. Vinyl - Durable, beautiful, and waterproof, vinyl floors install easily where traditional hardwood floors dare not go. They�re scuff and wear resistant, which makes them a great choice in areas where everyday living demands a tougher floor. Engineered vinyl plank offers the features of vinyl along with the quick and easy installation of laminate. Paired with its no-fuss maintenance, it�s as practical as it is stylish. Choose from a variety of wood-look and stone-look designs. Porcelain Tile - Available in a variety of realistic wood and stone styles this versatile, waterproof floor is great for bathrooms, laundry rooms, and kitchens, but also works well on walls and patios for a uniquely stylish statement. Porcelain tile is easy to clean, maintain, and it holds up to daily wear and tear. Flooring Accessories - From baseboards and stairs to underlayment and tools, Lumber Liquidators has everything you need to get the job done right. All the finishing touches to complete your new style and tie together the whole room, from shoe molding to thresholds.